Hubby improving bit by bit. Tired and washed-out, but definitely improving. Made more jam yesterday and it’s wonderful! excellent. Much better recipe, and I followed it carefully, instead of assuming I know it all and slinging it all in the pan together. Very pleased. The first spare battery I’d bought for my new phone was faulty, so sent it back for a refund. Bought another one, as I’ve been keeping my mobile on all the time while hubby was in hospital, and that involved swapping the SIM card from new phone to old one, so I could keep new phone charged up. New battery works a treat. The new phone also works very well as satnav, so have bought in-car charger and dashboard weighted holder for it. Excellent. £18.50 for both, and the app is free (skobbler) and works great. More Christmas presents bought, and brown wrapping paper along with red and gold wrapping ribbon. New duffel coat from Monsoon is excellent, have ordered one each of a red and a turquoise scarf and gloves set, to add a bit of fizz. Just finished Jodi Picoult’s “Vanishing Act”. Excellent. I do like her books. Next one is Leslie Thomas “Orders for New York”. Tomorrow am planning to try the new lash extensions I’ve bought and see how that goes, use up the six eggs which go out of date tomorrow making two carrot cakes and a trifle base or two, and rest in the afternoon. Am gradually catching up on my sleep, but I don’t think I’m very relaxed. I ache all over, in a muscle sort of a way, not in a flu/cold sort of way. Still – yes, still! waiting for appointment for wonky hands and feet. Am sick and tired of the pain now. Am using my ice packs almost all the time now, just to keep it under control. Hmph. Garden winter-ready now. All pots wrapped, taps and outside pipes insulated with bubble-wrap, bed to be re-planted weed-killered and covered with black plastic, weighted down with stones. Cat particularly affectionate at the moment, possibly glad both her food providers are back and available. . . . .
Hubby is home. Anaemic, a bit wambly, but home. Hooray! the GP is to put him on iron tablets to help with the anaemia. Lots of nice cups of tea – he’s quite particular about how he likes his tea, and after 21 years I think I’ve just about got the hang of it. Lovely bubble bath to wash off the hospital smell and just to feel nice again. The hospital care was absolutely wonderful. Everybody, from the top doctors to the cleaners, was just delightful, caring, kind and practical. That makes such a difference. In all my times in hospital over the past 30 years or so, only two nurses have ever been vile to me. And that was in a private hospital! Hubby was in an NHS hospital. They just don’t get paid enough, however much it is. And it isn’t much. The hours are long, they are permanently at full stretch, and still find time to spend with each patient, answering the questions patiently and fully. Fabulous. Now it’s time to recover. Convalescence doesn’t usually come easy to my husband, but this time I think it will be better, because he’s just so wobbly. I’m temporarily in charge of cooking! I can actually cook, but have lost the habit over the years. Tonight will be either: bacon or potato omelette, or breaded fish & chips with peas, or possibly a jacket potato. Decision to be made shortly. Cat is clearly delighted hubby is home, but has quite a subdued way of showing it. Lots of purring, and sitting next to him, and winding herself around his legs (here’s hoping she doesn’t actually make him fall over . . .) and much more playful now. The garden is winter-ready now. All pots wrapped. Front garden pots also wrapped in fine green mesh so they don’t look so ugly. Hoses and watering cans in the shed. Annuals mostly dumped. 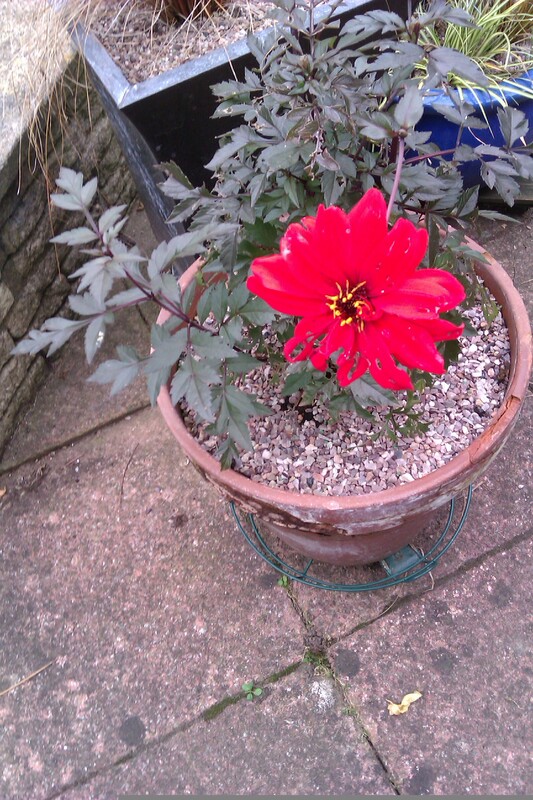 One more to go, but it’s a fucshia still flowering, so that can wait until the frosts kill it. I just need to put the outside tap covers on. I’ve even lagged the condensing boiler’s outlet pipe with bubble wrap? impressed? well, if not, why not? Still awaiting appointment for hands and feet. Still haven’t fixed the lack of dual boot on Ubuntu 11.10 but am getting some support now, so it is being worked on. Ordered a duffle coat today from Monsoon. I ordered size 12 and size 14, and will see which one fits. It’s camel coloured, so my black scarf/gloves set, and the cream set, will go, but if the coat fits, will get a red scarf/gloves set too. I really wanted a turquoise or red duffle coat, but you’d be surprised how hard they are to find at a reasonable price, yet made with wool. This one is both reasonably priced, and made with wool, so ticks almost every box, except the colour, which I will add with scarf/gloves. Hmph. Tomorrow Middle Son is flying over from Dublin to see his Dad, which will be just lovely. Youngest Son wants to visit too, and Eldest Son really has his hands full with three poorly children, full of coughs and colds, in his two bedroomed flat in Brighton, and a full time job in London. Must make some jam tomorrow. Have defrosted the blackberries and the cooking apples are just waiting to be dealt with – exciting. Will make a better job of it this time. Dumped the last lot, it was foul. Last Wednesday, hubby had a tummy bug. He ended up in hospital, very poorly indeed, needing 6 pints of blood, but is now stable enough to be on a normal ward, as opposed to a High Dependency Unit, and they have disconnected all six tubes. Some of the cannulas are still in, but the main one, which was just by his collar bone, and involved stitches (!) has come out thank goodness. So he’s been in hospital since last Wednesday night, and only yesterday moved to a normal ward. So many people have been sending their good wishes, it’s lovely. YD lives ten minutes from me, so she’s been fetching and carrying and cooking me dinner and things. ED needed to stop off here to break her journey from Southampton to Nottingham, so came up a day early and also fetched, carried, cooked, and looked after me generally. What wonderful people. All three of hubby’s sons have been in regular contact. None of them live locally, one lives in Dublin, one in Brighton, and one an hour’s drive away. I’ve texted or phoned them all every day and whenever there’s any news (usually when I’ve visited him). The cat is most discombobulated. Her routine is all over the shop, and although she lets me cuddle her, she’s clearly not happy that he’s not around. Hopefully in a few days, when he’s walking about without fainting and his system is back to normal, they’ll let me bring him home. Well, I must say I’m pretty p*ssed off really. My hands/arms are spectacularly painful, and I’m still waiting for an appointment with the consultant. He has at least received the referral letter, but meanwhile I’m taking painkillers and have been for a year, and putting a cold pack on them several times a day to try and reduce the pain. Even getting dressed is an ordeal. Hmph. The weather is still beautiful, sunny, windy, but colder. That’s fine, we’re mid-October! I do have some gardening to do, but that will have to wait a few days at least. The pots need wrapping up really and that’s one of the jobs I need to do. Have upgraded hubby’s computer to Ubuntu 11.10 – what a performance! blimey. No dual boot, Unity desktop – which takes some getting used to – but he’s actually managing well. Windows is still on there, but we just can’t get to it! which is a big bummer. I’m sure it’ll be fixed in one of their updates. Hopefully. Cat has finally stopped having unpleasant tummy symptoms – fortunately she uses her tray for everything except vomit. Nice pile of which was on the 4th stair down – luckily I noticed it before stepping into it . . . but she’s fine now. Still working on Xmas and various birthday presents – only a few things to get now. But big things . . Mother is currently in Scotland, driving around, staying at various hotels, seeing various friends. Amazing, at 79! We made her promise to take her stick, and use it for its intended purpose, rather than pointing at people/things. I’m not sure why, but my life currently seems very fraught. Lots of rushing about, still not doing all the things I want to do. So I’m going to sit tight for a day or two and see how things pan out. The first lot of jam I made from actual fruit (apple and blackberry) is only passable. I cooked it for too long, so it’s set quite hard. That in itself isn’t too much of a problem, but it just tastes like cheap jam. Like the jam you get in bought jam tarts. But it’ll be ok in my goat yoghurts. And there’s only three jars, so it’s not a real disaster. It was an experiment, so next time I’ll be more careful. I have loads and loads more blackberries and bought some cooking apples yesterday, so when life has settled down a bit I’ll have another go. The new phone is going well now, although it has taken me a while to get used to it. But it’s fine. Am also a bit fed up with blood tests and hospital visits, but not to worry. All will be sorted out in the end. Well, a busy week all in all. Monday – can’t remember, too long ago. Tuesday – haircut and went to various shops while I was in Solihull. I needed to go to the health food shop and got some oat bran and some tea tree oil, also some herbal tea which is difficult to find in the supermarkets now. Wednesday made some apple and blackberry jam from fruit I’d been given. Half of it was made into a delicious crumble, the rest into jam. I’ve never made jam from fruit so this was a first – and a raging success, I’d say! Thursday – slept in then to Stitch Solihull in the evening, after taking all the Next stuff back to the shop and going to H&M instead. Better range, nicer colours, and cheaper! Rude not to really. Friday – to my friend Sylvia to fetch her computer for repair, and to my friend Sue to re-wire her computer with new USB lead and new power lead. All working now. Today spent working on Sylvia’s pc. It involved taking everything out of the old case and putting it in the new case. All went swimmingly until I tried to boot it up and it wasn’t having any. Eventually, after much faffing around, and eliminating things one by one, discovered that the IDE socket on her motherboard is not working, and had to disable it in the BIOS for it to work. That involved swapping her IDE DVD RW for my SATA DVD RW, but all is working now, both with her pc and mine. And her pc is running quietly! hooray! Am now exhausted and am off to bed right now. Well, I’ve changed to wordpress because blogspot changed all their interface and I hated it. I’m a bit low today, to be honest, because – well, not sure really, but have discovered my 79-year-old mother had a nasty fall the other day and didn’t tell me when I phoned her the other day, and we spoke for about half an hour, also because my arms and hands are very painful, and I’m fed up with that, and I’m just bad-tempered I suppose. But I’m smug about the garden – here are some photos of how it’s looking at the moment. I decided I’d plant a few more annuals – have planted some cream and dark purple peony-head poppies in the front and back garden, and the corner bed in the photos is full of bright blue and dark purple cornflowers, which I’m hoping will look nice next year. 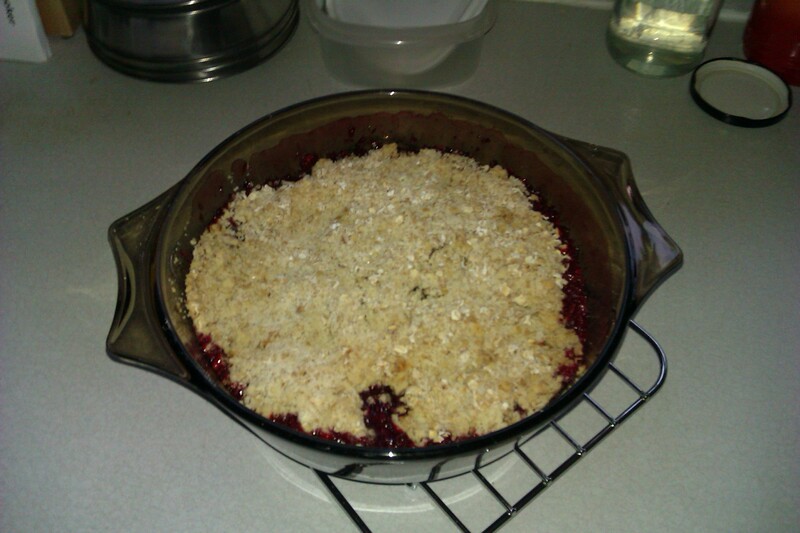 Have also just made an apple and blackberry crumble – the fruit was given to me by my friend Sue. I’ve kept half of it back so I can make some jam this coming week – need hubby’s help with that because I can’t lift the jam pan once it’s got stuff in it, but it’s all quite exciting. I’ve only made marmalade from a kit, I’ve never made jam from actual fruit before, so it’s a new experience for me! Tomorrow I’m making bread rolls and cleaning bathrooms. Well, definitely the bread rolls, will have to see whether I’m up to bathroom cleaning as well, but we’ll see. I must let everybody know this new blog address – I know of two people who definitely read this, my niece who’s currently in Kazakhstan I think, and my French friend Rejane. Well, I think that’s probably it for today. I’ve changed my blog from loonyfeminist.blogspot.com to loonyfeminist.wordpress.com because they changed the interface, and I just couldn’t get on with it at all. Luckily I was able to export all my posts to wordpress, so the old stuff should be visible, and the photos too.